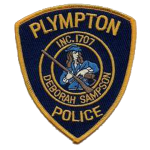 Support Plympton Police Department’s Fundraiser! Thank you for considering a gift to Cops for Kids with Cancer in support of Plympton Police Department’s fundraising activities. We are so grateful for the team at Plympton and their tireless efforts to raise money for our charity. We are passionate about the work we do and sincerely thank you for supporting us and enabling us to continue our support of families battling childhood cancer.